I’ve now completed data collection for my pilot survey, and have taken a peek at it in the statistics program SPSS. I haven’t used this program before, but it looks like it should be fairly easy to learn (famous last words!). I’m now coding in the correct answers. Here’s what my data looks like. I thought that I’d gotten 408 responses from students, but when I looked more closely, several hadn’t answered all the questions. I really only got 268 usable responses, but that’s still enough since I only needed 5 times the number of questions (51). Tove and Torstein helped me to get started today with exporting and “cleaning” my data. They also showed me how to do the tests I need in order to determine which questions (called “items” in research) are useful, and to eliminate items that aren’t useful. For this I’ll use Classic test theory (Point biserial correlation and Item facility), Exploratory factor analysis, and Item response theory. Yippee! I’m on my way! Today I had a 2-hour final exam in my statistics class. It was a digital exam with 19 short answer, multiple choice, and fill-in-the-blank questions. It’s pass/fail, and although I know that I got some questions (partly) wrong, I’m pretty sure I’ll pass. The first question was really hard, and I was worried that if all were that difficult I’d be in serious trouble, but luckily there were some easier questions too. Most of the topics were covered in the lectures, but one question included a term that I’d never heard before, so I just had to “row” as we say in Norwegian (or “BS” as we say in English!). This is our textbook and it’s actually quite funny. 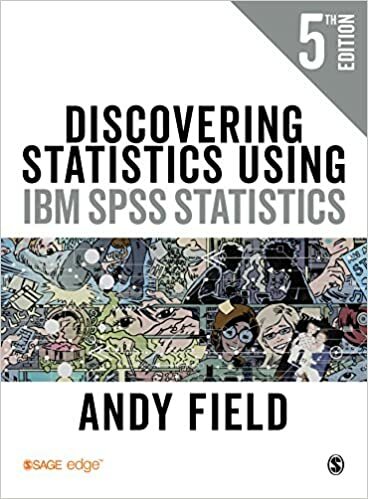 The author makes statistics (almost) enjoyable! Argh! I thought I liked numbers, but I’m totally baffled by the statistics class I’m taking. The teachers are wonderful and the textbook is great, but I just can’t get my head around the null hypothesis that’s used to calculate statistical significance. It’s like my brain is willing to go just so far, and no further. Our teachers ask often if there are any questions, and no one asks. It’s either because everyone else understands it, or perhaps, like me, they don’t understand enough to even formulate a question. This is incredibly frustrating, as my research is quantitative, and I totally need statistics! Hopefully, before the exam on April 11th, I’ll somehow understand more – otherwise I’m in trouble. This course is for PhD students in any field, and there were ca. 30 students. Right now I’m working on a paper (as you can plainly see! ), that needs to be turned in before April 12th. I enjoyed the course and the reading, and commend the library for their good work! I also got feedback from NSD (Norway’s Data Protection Services), approving of my plan for the processing of personal data in my project. Another small milestone. Next week’s project is to write a Data Management Plan (DMP).